I don’t like dresses, so every year around this time, panic sets in because the holiday parties are a’coming and I have to scramble to find something to wear. I always thought I had to wear a dress to that holiday office party. Or on NYE. And I always felt frumpy and uncomfortable because I was in a dress I didn’t really like and scraped together at the last minute. Then, for last year’s holiday party, I had an epiphany…and an awesome pair of navy tweed pants. I was warm, at ease, and got lots of compliments, probably because I was more confident in clothing that better fit my personal style. So, for all you non-dress-girls out there…here’s a little cheat sheet to easy holiday outfit ideas that aren’t dresses. 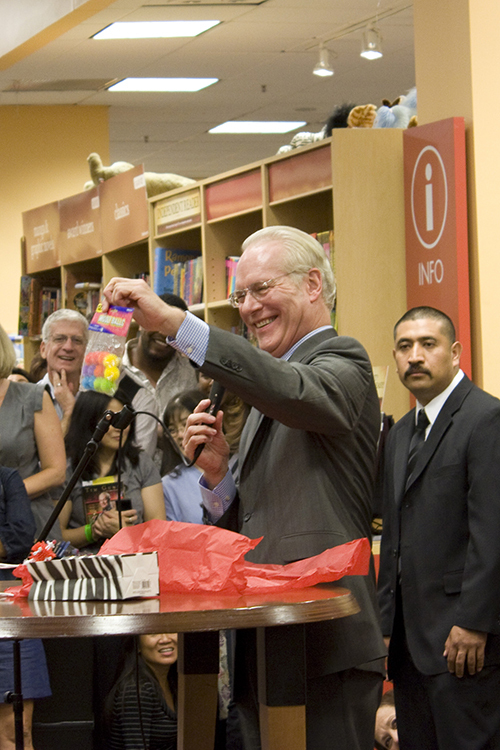 Tim Gunn and a Giveaway! This is a great guide. I am still in learning mode as a blogger. What do you use to put together such great collages with links for affiliate brands? I’m trying to find the best tool to use with Linkshare for example. Thanks so much & Happy Holidays. I really appreciate the tips and tutorial links Kelly. This is extremely helpful. Happy Holidays! really great pairings !! loving all the accessories !! I struggle with wearing pants in the winter because of the bare ankle thing, any suggestions for ladies in colder climates? Hi Ashley! When I was in NYC last winter, I went one of two routes depending on how far I was walking/going. I either wore thin trouser socks under my pants/heels until I got to my destination, then I slunk off in a corner before anyone saw me so I could pop off my socks and stuff them in my handbag. I also just sucked it up and went bare-ankle if I was quickly darting between cab/indoors. You can also try wearing hose under your pants that match either your shoes or your skin tone, but I haven’t personally been successful in making that look good. If anyone else has suggestions, I’d love to hear them! Those socks look really interesting, I’d be interested to hear a review from someone who has tried them. I’ve had the same experience with trying to do regular socks or tights with pants, it just never looks right. loving all the fancy pant options!! Just wanted to say a big THANK YOU for posting all these options! I’m a petite girl who likes to dress with a mix of masculine and feminine silhouettes and elements, but I am not big on dresses or skirts. Although I will not be going out for NYE, I do attend conferences as a grad student, and many of these pant/top options are great chic & professional ideas for me to try so I feel appropriately dressed, stylish, and most importantly, myself! Thanks for all your menswear-inspired posts, and I just generally love your site. You help me feel more like my style is not only acceptable, but awesome! Love this!!!! Can you do a similar post for Summer Wedding Guest who doesn’t do dresses? I was thinking along the same lines of fancy pants, silk blouse and soft jacket. Thanks for the great post as I am not a dress/skirt lover for myself. Those KeySocks sound interesting too! Happy Holidays!